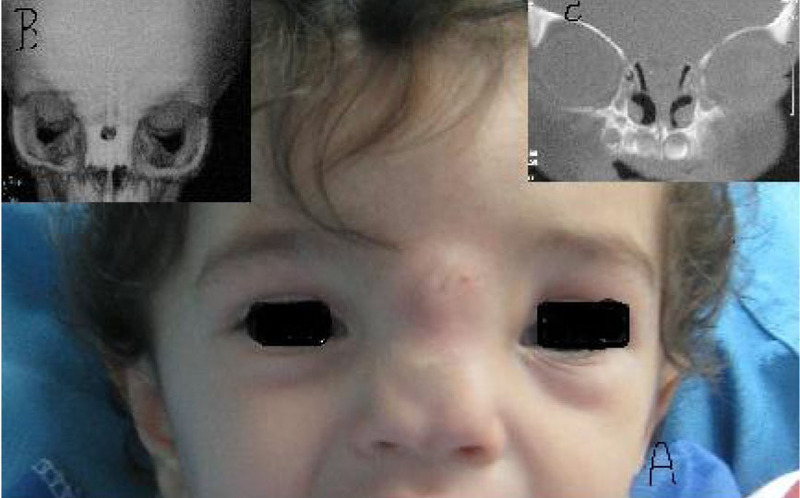 To Cite: Shahjouei S, Nejat F, Khashab M. Basal Encephalocele Associated with Teratoma; Pathogenesis and Management, Case Report, Iran J Pediatr. 2013 ; 23(2):241-242. Encephaloceles are rare entities presenting as protrusion of intracranial structures through a defect in the skull[1,2]. Teratomas, tumors with the potential of giving rise to all three germ cell layers, are other rare entities which can involve the intracranial components. Here we describe a patient with basal encephalocele associated with teratoma. A 9-month-old girl was referred to the neurosurgical department due to small frontal mass since birth and progressive hypertelorism. On examination she had a bifid nose, prominent hypertelorism and small midline mass covered by abnormal skin and small thick hairs (Fig 1). She was normal in developmental status. Brain magnetic resonance imaging showed normal brain but nonhomogenous anterior fossa mass. Computed tomography scan confirmed a small hole in proximal portion of nasal bone, associated with a nonhomogenous mass between the two right and left ethmoidal sinuses that seemed to be in continuity with extracranial mass descending through the nasal bone defect (Fig. 1). Surgery was performed through bifrontal craniotomy. The nasal small defect contained a lipomatous tissue that traversed the bone defect to intracranial space and was going to anterior fossa intradurally to reach the basal mass. There was a 2×2 cm bone and dural defect in the anterior fossa, around foramen caecum, which was filled with basal mass (Fig. 2). Fig. 1: A: Photograph of the patient shows hypertelorism, small midline mass associated with nasal pole widening. B: Brain CT scan reveals a small hole in the proximal portion of nasal bone. C: The mass is located between two ethmoidal sinuses displacing two sinuses laterally. laterally which was en bloc resected. The dural defect was repaired with pericranium patch graft and the basal bone defect was covered with bone harvested from posterior part of craniotomy. 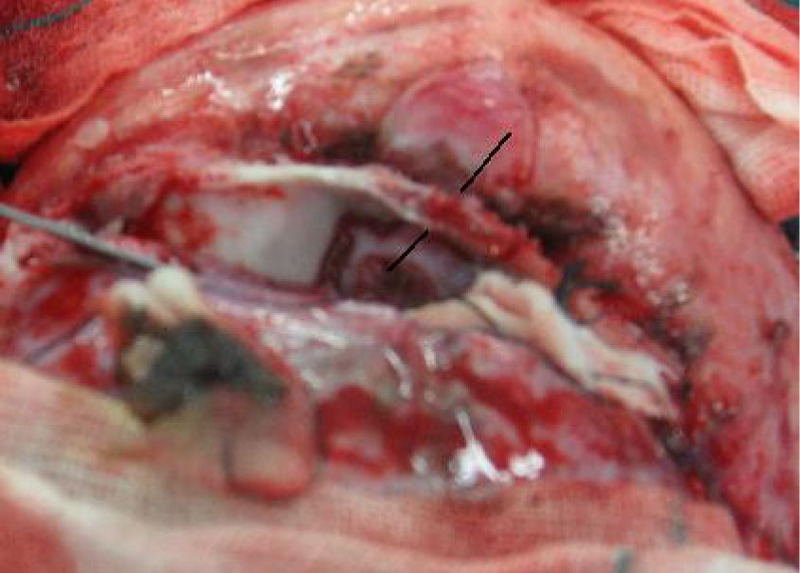 Pathological examination of the surgical specimen revealed a variety of tissues including neural tissue, muscle, cartilage, adipose tissue, vascular structures, and respiratory epithelium diagnosed as mature teratoma. The postoperative period was uneventful. She had regular follow up and now one year after surgery, she has normal development and growth without recurrence of the tumor or progression of her hypertelorism. Teratoma is the most frequent congenital tumor with early presentation at birth. Head and neck teratomas account for 2-9% of all teratomas. Our patient had an anterior encephalocele accompanied by teratoma. According to our extensive literature review, this association was very rarely reported so far[2,4]. Several hypotheses had been suggested to describe the pathogenesis of encephaloceles or teratomas but association of two entities cannot be simply explained by these models. Enrolment of tissue induction through different steps of embryogenesis and neurolation has been suggested in the pathogenesis. Migration and differentiation of neural crest cells affect greatly the fate of other cells and interrupted migration[5,6]. Human neural crest cells develop late at the first month of embryonic period and give rise to neurons and glial cells of peripheral nervous system, meninges, dermis, bone, cartilage and some other tissues. Failure of neural crest cells migration, by interrupting this induction effect and preventing correctly cell differentiation can result in major structural defects like encephalocele. Surprisingly, human neural crest cells have the characteristic of uncommitted stem cells due to highly similar molecular profile to pluripotent embryonic stem cells. On this basis, neural crest cells can be able to produce tumors consisting of three germ layers, commonly called teratomas. However, by this hypothesis we would expect higher incidence of encephaloceles containing teratomas. This controversy might be solved by assuming that formation of these two entities needs defect in early stages of differentiation, resulting in defective development of other structures and putting the embryo in the risk of prenatal death. The other hypothesis can be interpositioning of teratomatous cells in the tissue producing the future skull that makes bone defect and subsequently encephalocele. The impact of basal encephaloceles on the surrounding tissues develops hypertelorism which progresses rapidly during first years of life. Early surgical correction of this abnormality can stop or even prevent hypertelorism.